Photos from the open evening. 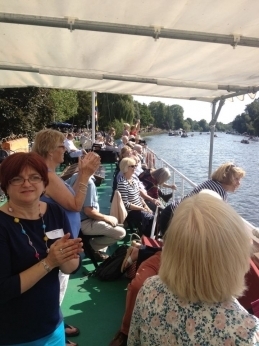 Friends of the River Thames Boat Project provide vital financial support to the Charity (Registered Charity No.1080281). We would really like to welcome you to our Friends family. You would be helping us by providing the financial support to give so many people a wonderfully therapeutic day on the river. Friend commit to donating a certain amount each year, either monthly or annually. Our suggested minimum levels of donation are shown below (of course we welcome more!). Annual payments are greatfully accepted but monthly payments by standing order or PayPal (available shortly) help us to spread our income over the year (and are less painful to you!). * Lifetime Friends make a one time payment. Whenever possible we want to maximise your contributions by claiming back Gift Aid. If you are a taxpayer this increases your donation to us by 25%. We also welcome businesses and community organisations who would like to support the Charity. If you would like to become a Corporate Friend or Community Friend or know someone who would, please contact us (info@rtbpfriends.org) for more detailed information on our Corporate and Community programs. For all communications and our quarterly newsletter to our Friends we use an email system. Should you ever wish to unsubscribe from these emails, you can just use the unsubscribe option which is always present at the bottom.